A few weeks before I travelled to Phoenix to spend time with my sister, I took advantage of her US address and placed an order with Nanami Paper. 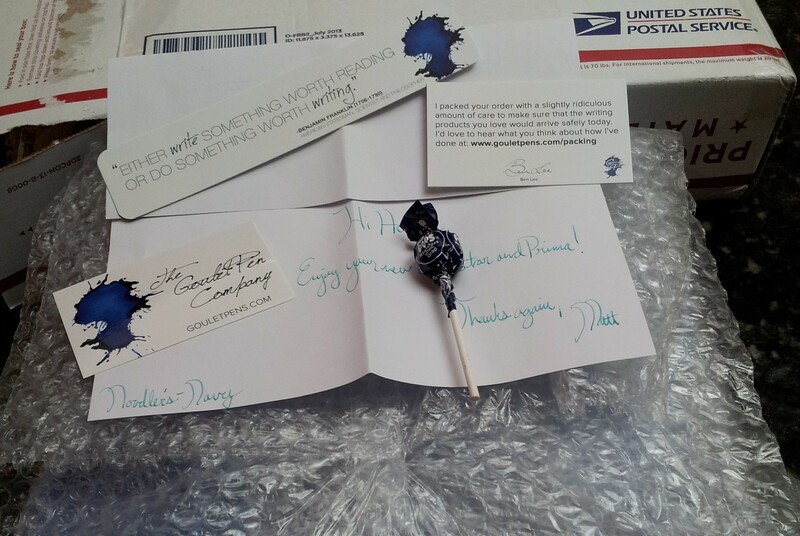 You might remember that before my trip last year I placed orders with Goulet Pens and JetPens. It’s always nice to avoid paying shipping costs to Canada. I wanted to buy another Seven Seas Writer like the one I wrote about in May of this year, but of course they were sold out. They are so popular and they are specially made for Nanami in Japan so they go out of stock quickly. I like the Writer because it is lined but it occurred to me that I could get a Seven Seas Standard A5 journal and use my writing mat and achieve the same end. And woohoo the Standard was in stock. 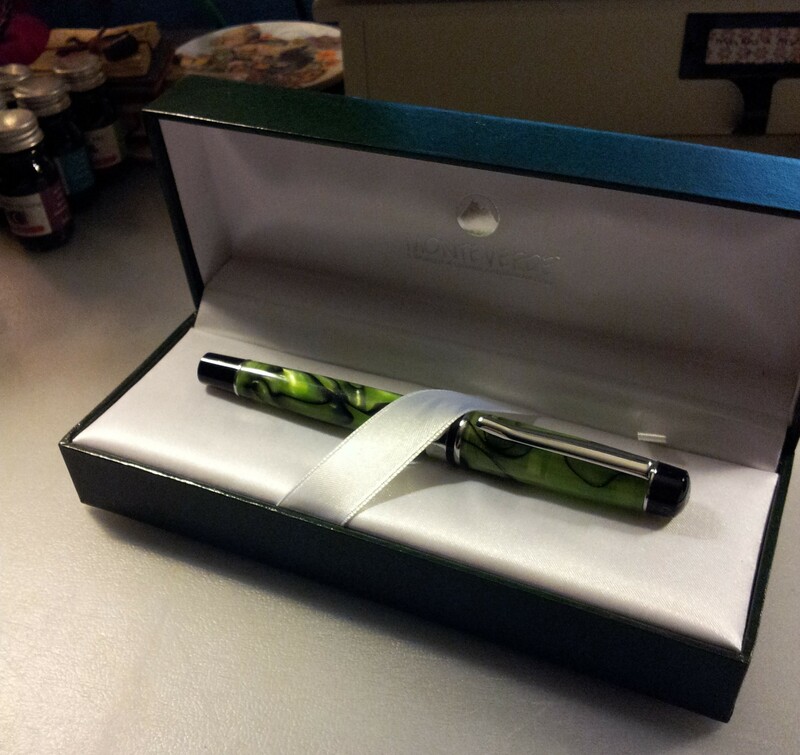 I also ordered another Hold On pen loop, this time in green; I actually ordered two and gave one to my sister. The silvery clippy things are the Super Clip Bookmarks, and come in packs of 10 for $4.25 US. The Standard is exactly the same as the Writer, which I’ve already reviewed (see link above). But I wanted to see if I could use the writing mat to simulate lines. It’s not easily seen in this photo, but in real life it’s very easy to see and write on the lines of the mat. If the lines aren’t dark enough for you, you can always make your own insert with a Sharpie or similar dark inked marker. I am happy with the Standard; it’s a good substitute when the Writer is out of stock. And as I write this I’ve just checked Nanamipaper.com and both the Writer and the Standard are currently out of stock. The Standard will be restocked in Feb/Mar 2016 and the Writer in early Dec 2015. Get your orders in fast and early. That was the only package I had delivered to my sister’s place. And during my stay I only bought one notebook: a Write Now journal from Compendium Inc. My sister and I went for High Tea at the Arizona Biltmore Hotel and while perusing the gift shop I found this pretty notebook. My first thought on reading the cover was – Why yes, I’m doing just that! It’s a beautiful notebook with quotes about the sea. It was an inexpensive notebook and the paper isn’t great, but I fell in love with the cover and the quotes. And that is as good a reason as any to buy a notebook! 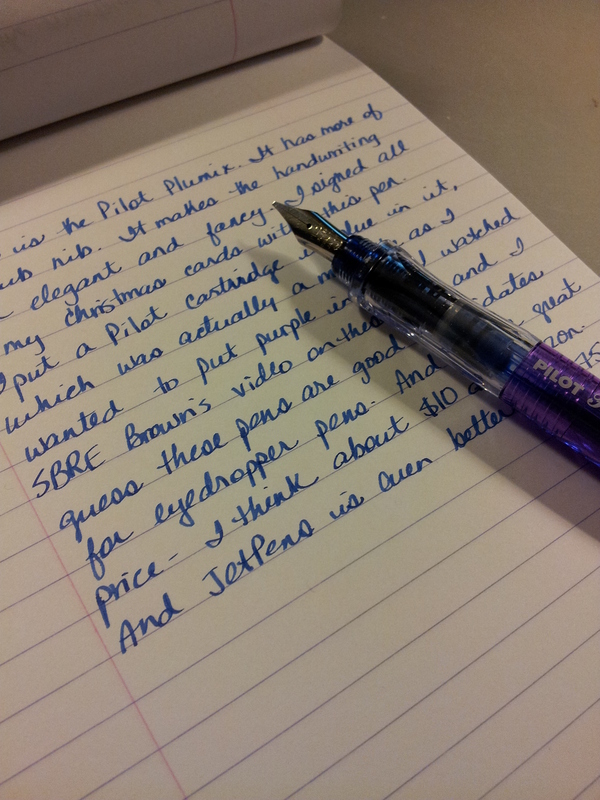 JetPens have the coolest articles! I really enjoyed Our Favorite Notebooks for Fountain Pen Use. I saw some old favorites as well as some new ones to try. Very thorough. I soften into what’s true (even if it doesn’t make rational sense), rather than blaze a trail on the page for the sake of it. The page doesn’t judge me for being irrational, inconsistent or ridiculous. And finally I’ve been enjoying the Tulip Tube channel on YouTube and I thought her video on what she journals about was very interesting. It’s the question I get the most so I thought I would share it here. 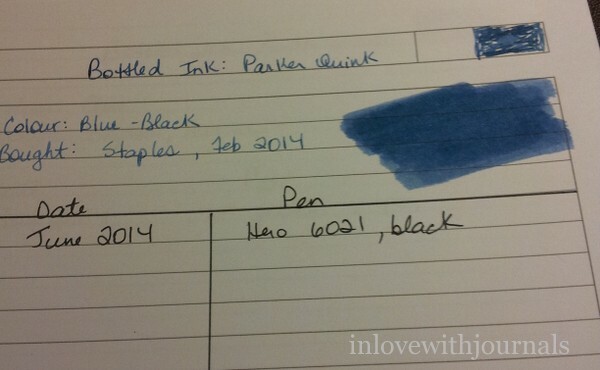 Calling all blue black ink lovers! I am one of you, and I was excited to see this article posted on JetPens comparing some brands of blue black ink. Great article, but I was surprised to see the swab for Parker Blue Black (each swab is listed under its name). 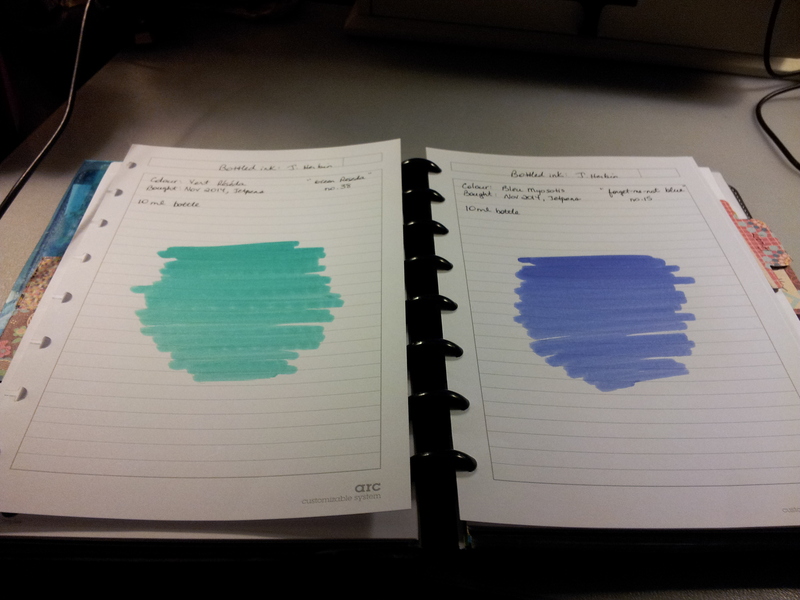 I use Parker Blue Black a lot and mine looks much darker than that. See for yourself. This page above is from my ink journal from February of last year and this one below I did about half an hour ago. 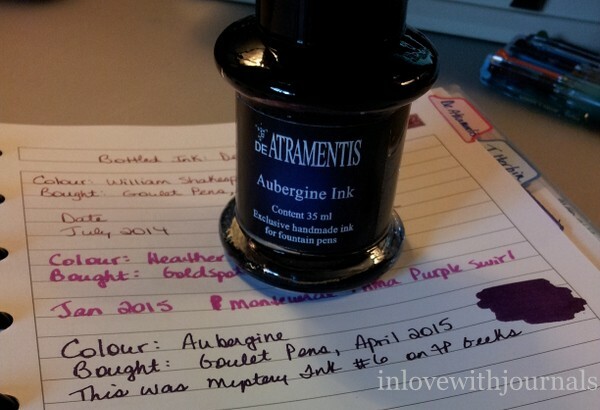 Maybe my ink bottle is old; it was purchased in February of 2014 so it’s possible. 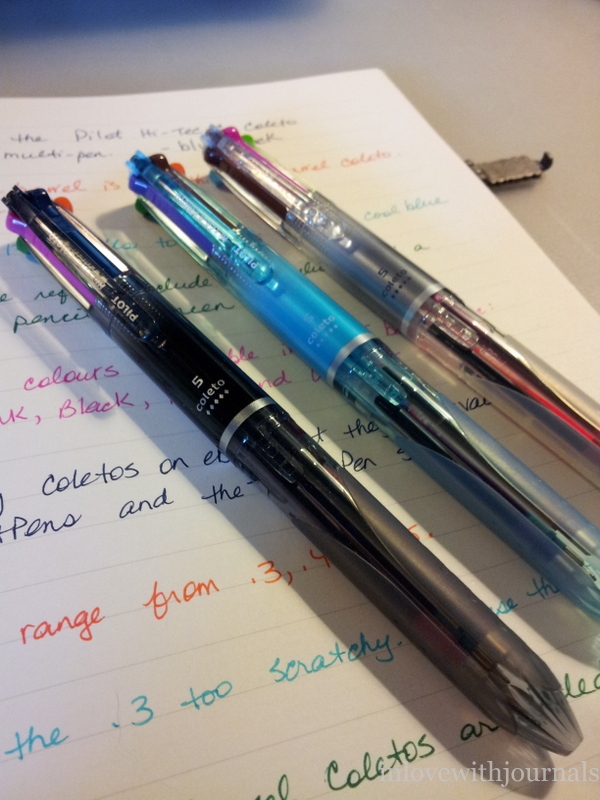 Because I can’t see the experts at JetPens making a mistake, especially since they go on to describe the Parker Blue Black as a “teal-leaning blue”. I would not agree but that’s ok. Anyway just something I noticed that seemed to jump off the page at me. 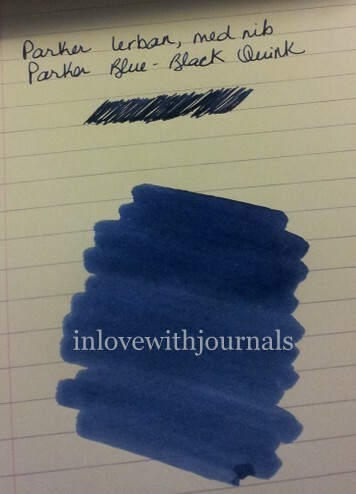 If any of you use Parker Blue Black let me know your opinion. This was kind of exciting: Brian Goulet mentioned inlovewithjournals in his Goulet Q&A, Episode No. 88, in answering my question from the previous week. Check it out here; my question is the first one. And finally a rousing article from theutopianlife.com, about the 10 Surprising Benefits You’ll Get From Journaling. I heard Nathan’s interview with Thai Nguyen in his podcast on his site, Write4Life and I was moved to check out Thai’s site. This article is great and yes, it will be copied into my journal. Enjoy! 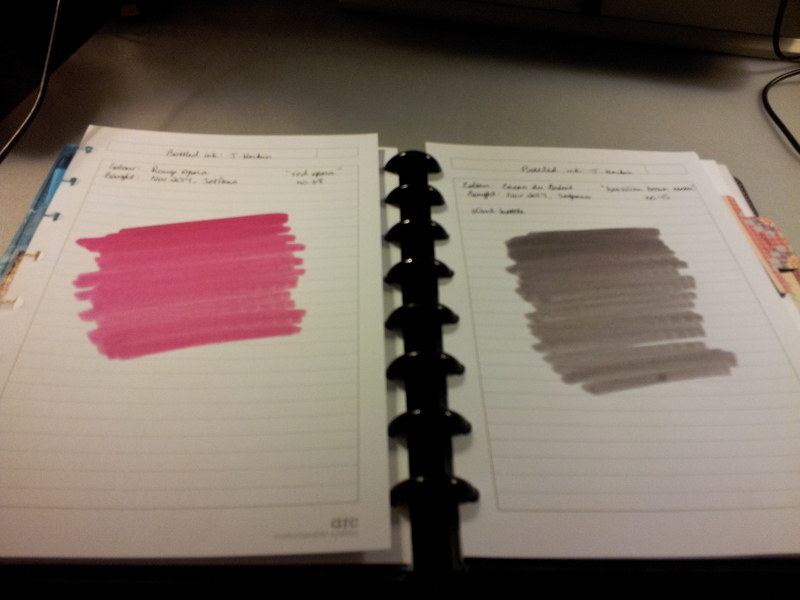 Still loving my Monteverde Artista Crystal Demonstrator, which I’m using every day in my journal. 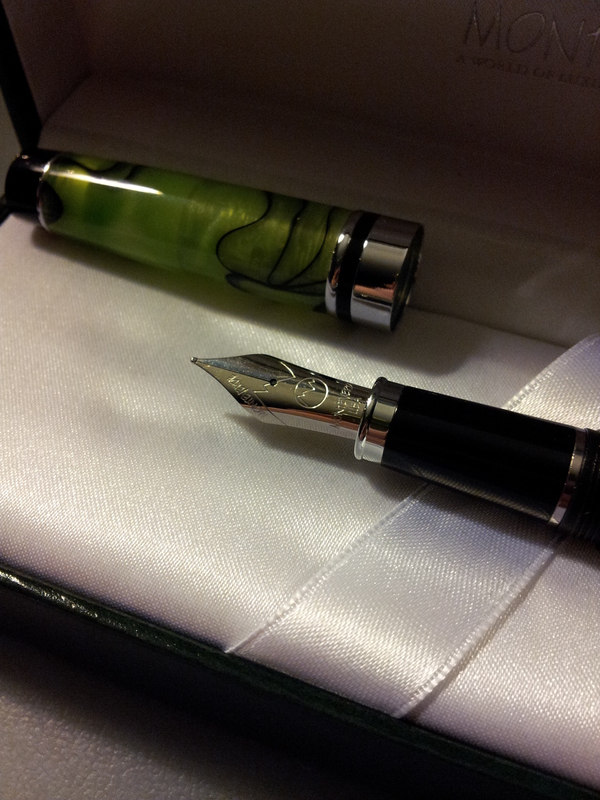 My next monthly pen will be chosen on June 24. I bought some ink this past weekend but you already know that from this post. And that’s it for purchases. This Tuesday’s cooking class was phenomenal!! The chef made Teriyaki Tofu Lettuce Wraps and seriously this meal was the best in the series so far. No joke. And I am NOT a fan of tofu – until this recipe! Awesome. I mentioned in my Sunday post that my sister and I went out to celebrate her birthday. For her actual present I bought her a black Pilot Plumix from JetPens (see my post on my Plumix here) and her very own Stone Paper journal from Things Remembered (see my post on my Stone Paper journal here). She had admired mine so her birthday was the perfect opportunity to get her one. I had her initials engraved on the clasp. She was really happy with both items! One of the shops we hit on our birth-day-out last weekend was Indigo (a store in the same family as Chapters up here in Canada). We had such fun wandering around looking at books and making suggestions to each other. I came home with some lovely books and so did my sister! Wonderful day, as planned. We always have a ton of fun with each other! So here is Part 2 of my visit to Scottsdale Pen and Knife. For the first part, click here. I had a lot of fun with these purchases at Scottsdale Pen and Knife. 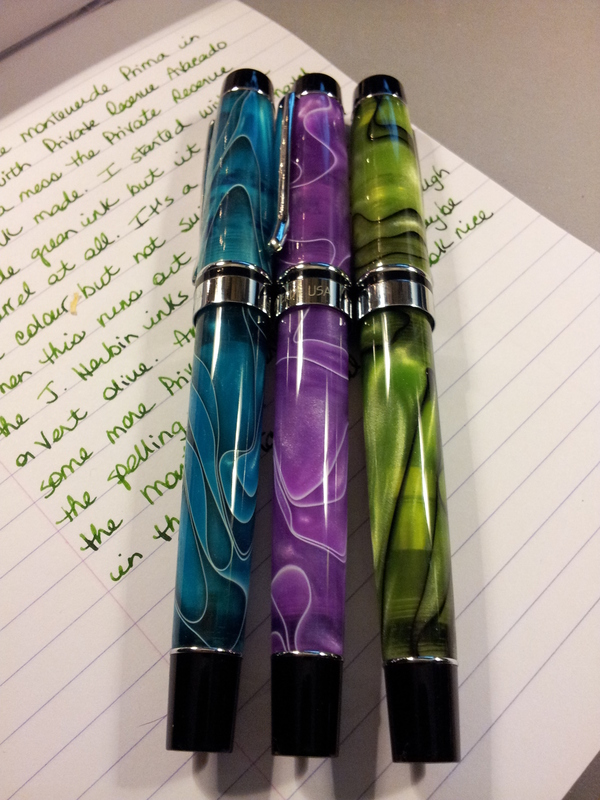 The Monteverde Artista was a complete impulse buy. I had seen a couple of reviews and I’ve been wanting a demonstrator model for a while now. And when I held it I had to have it. The nib is different from my Prima pens; instead of a stylized mountain range we have curlicues. The section is smooth which looks great but I had extreme difficulty untwisting the section from the rest of the pen so I could ink it up. I had to ask David to help me. 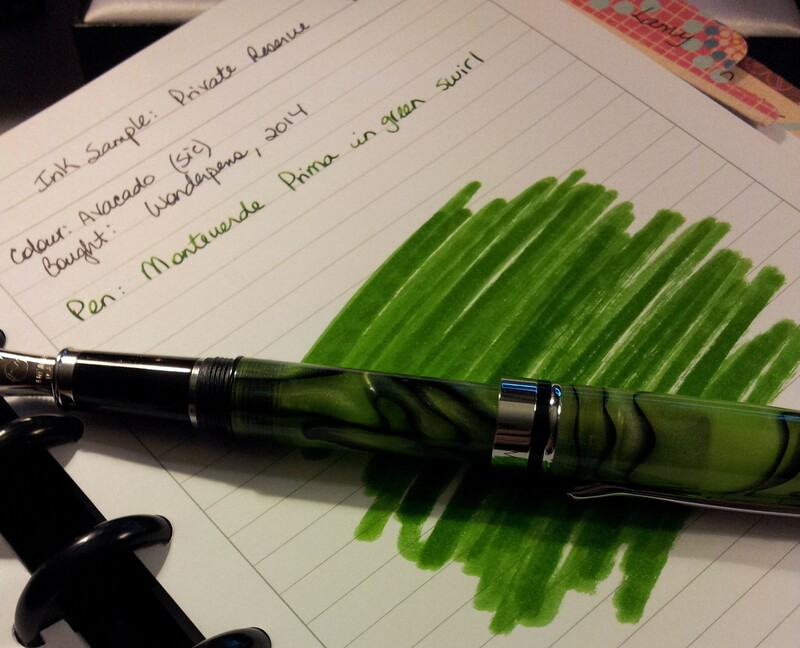 I decided to go with Monteverde Green because it’s a beautiful colour. Here you can see the ink in the barrel. Here’s a close up of the feed, which is normally clear. It’s a wonderful writer and very pleasing in the hand. It started up almost instantly (not as instantly as the Metropolitan) and I didn’t mind the smooth section, although I found my fingers grasping above the section naturally, even though with other pens I grasp the section further down. Must be a reaction to the smoothness. 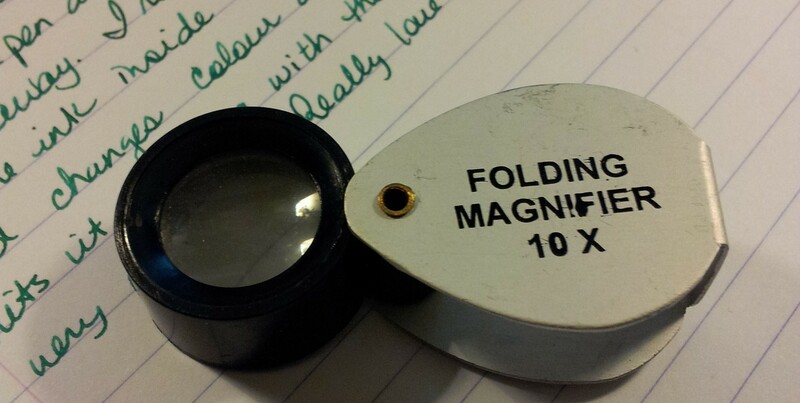 Moving on to the folding magnifier. I bought one of these on the advice of SBRE Brown in one of his videos. I wanted to be able to see the super small writing on some of the nibs. And it was a bargain – I think it was under $5. 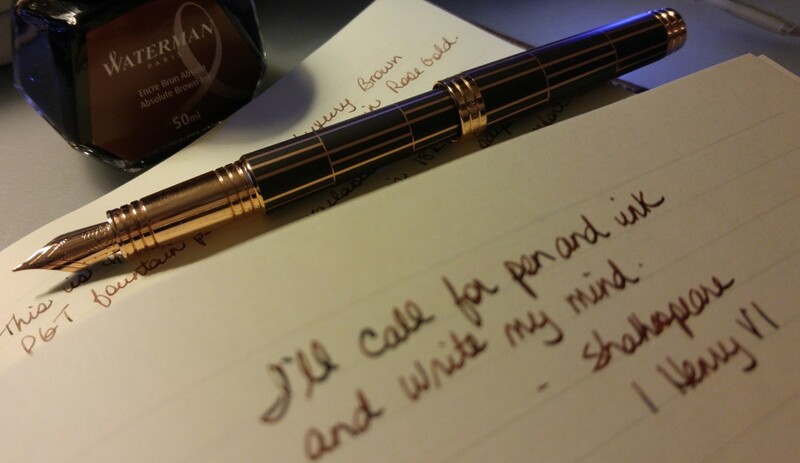 The second pen I bought is the Pilot Plumix. I was intrigued by the shape of the pen. To me it looks like George Jetson would be using this thing. And here it is with the cap off. The cap unscrews and posts tightly. It has two fins on either side to prevent rolling off the edge of the desk. Here’s the writing sample. You can see how it has more of a stub nib. It makes for elegant handwriting; I’ve signed all of the Christmas cards with this pen so far. 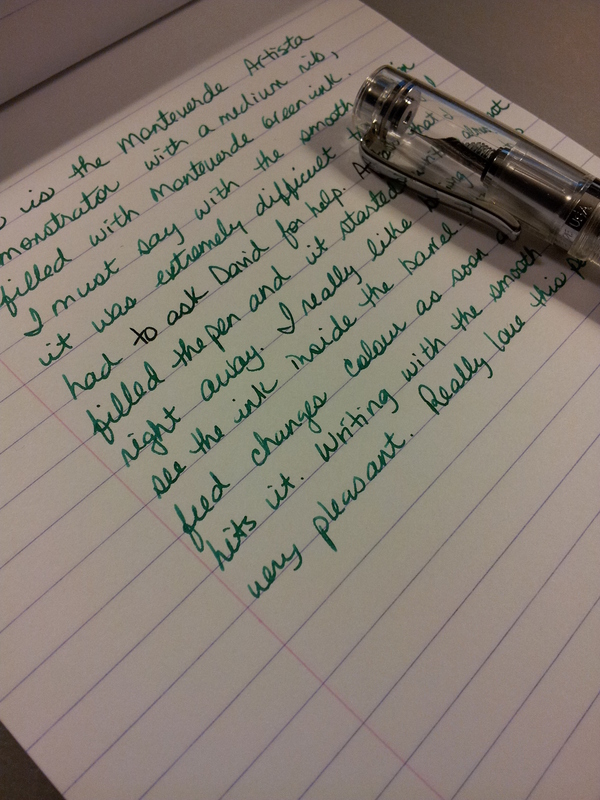 It’s more palatable than my Manuscript pen; I love it and will probably get another one as they are not expensive. I believe I paid $10 but JetPens has them for $7.25. They come in black and blue as well. I put the blue cartridge in this purple one by mistake; I like my barrels to match my ink but I chose the blue cartridge instead of the purple one. The cartridges are the Pilot Mixable Colour. One of the big draws about this pen is the huge ink capacity the pen would have once it is made into an eyedropper, which is easily done as the pen is all plastic. Might have to make that conversion. 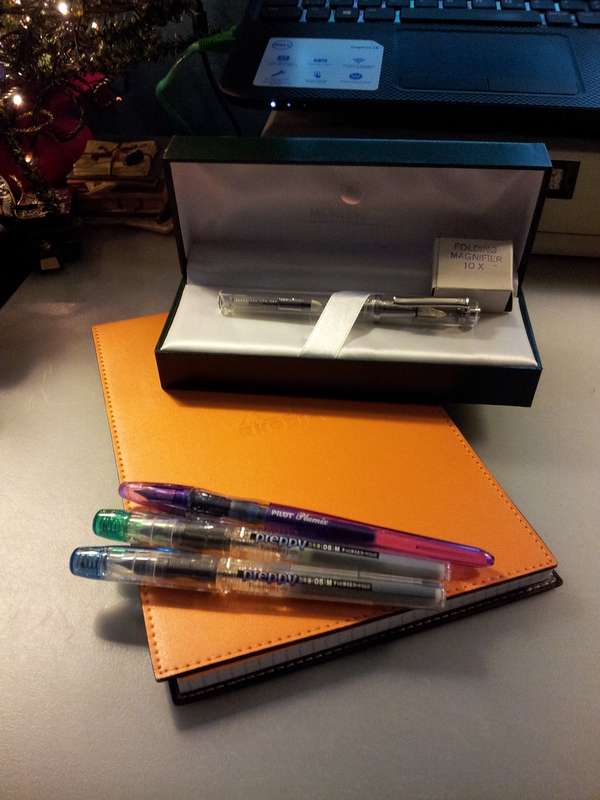 And lastly (for the pen purchases) I picked up two Plantinum Preppy pens. Everyone raves about what a great value they are (usually less than $5) so I’ve been wanting to try them for a while. I must say I was not as impressed as I wanted to be. 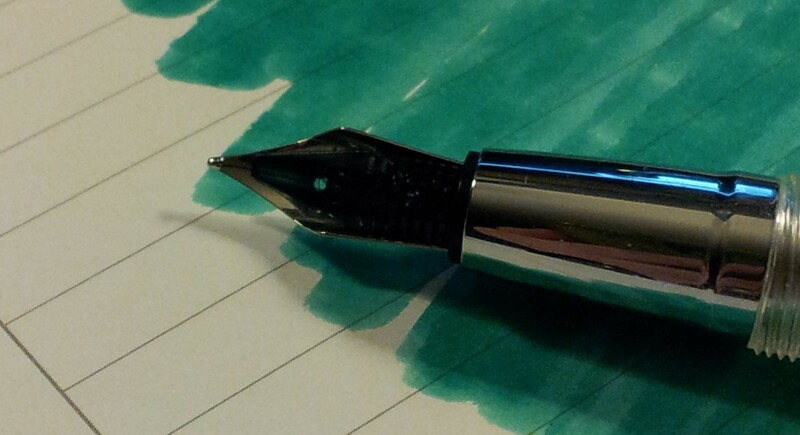 I enjoy the colour matching going on, with the nib colour matching the clip/cap colour, but the ink seemed dry and I found the pen skipped a fair bit. 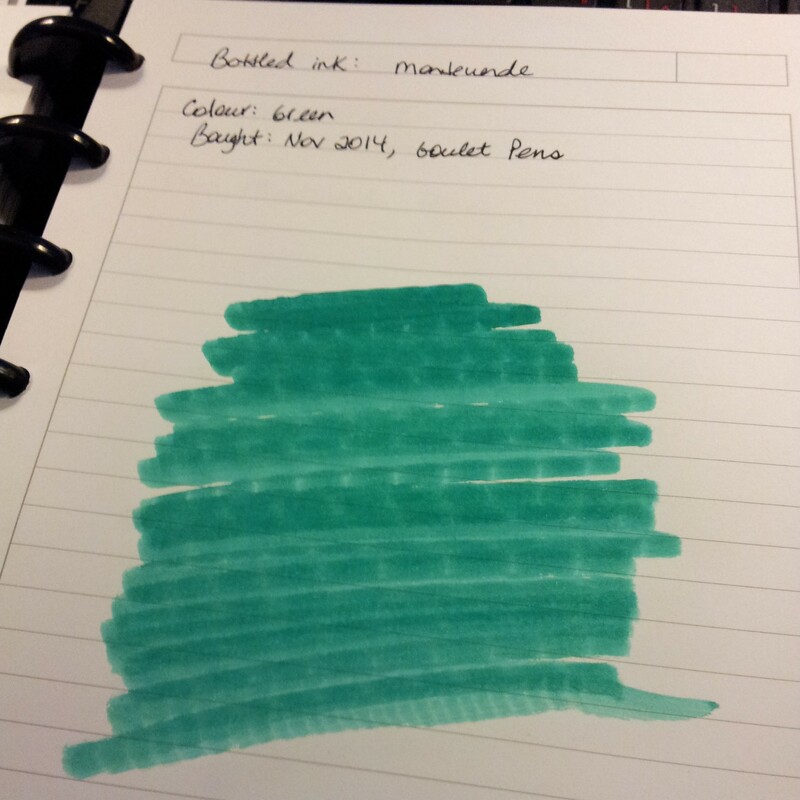 The ink colour is a great shade of green. They are also candidates for making into an eyedropper pen. 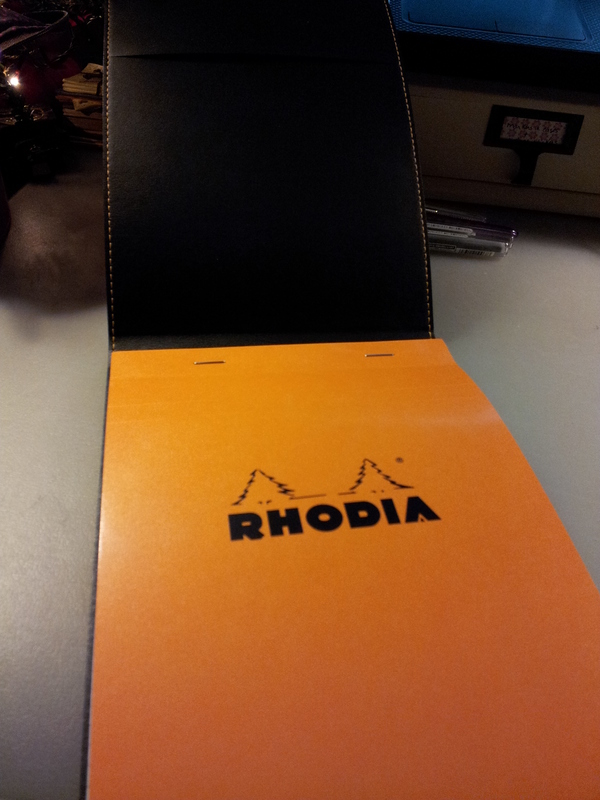 Here is the Rhodia Orange Leather Notebook Cover. I love my notebook covers and couldn’t resist this. The leather is very soft and smells wonderful. I chose the orange because it is just so striking. The holder comes with a pad and a pen loop. The pen loop is super snug so I had to resort to clipping the pen onto it. 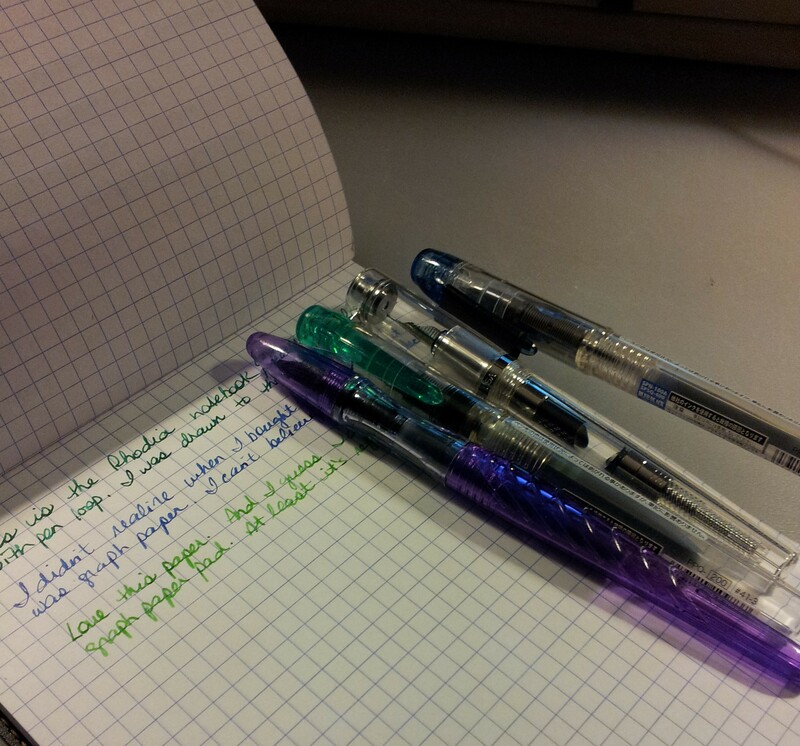 I didn’t realize at first that the pad I chose had graph paper; I prefer lined. But no matter. It’s such beautiful paper it will get used! So that’s it for my visit to Scottsdale Pen and Knife. I’m sure it won’t be my last! 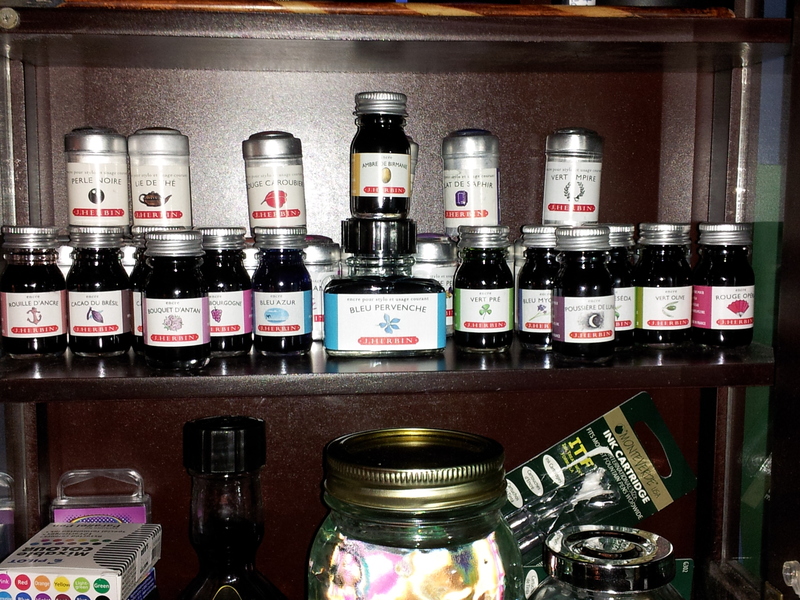 I bought my first tin of J. Herbin ink cartridges in Aug of 2013 at Duly Noted stationery in Halifax. 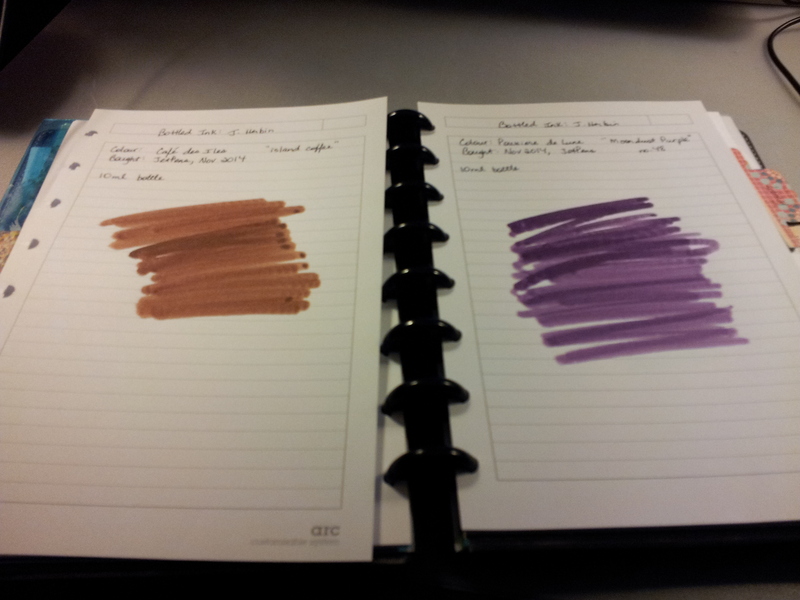 Since then I’ve wanted most of the 30 J. Herbin ink colours. I am 14 colours closer to that goal, thanks to my recent trip to Phoenix and my sister allowing me to place an order from JetPens using her Phoenix address. I now have 28 of the 30 colours in the collection. 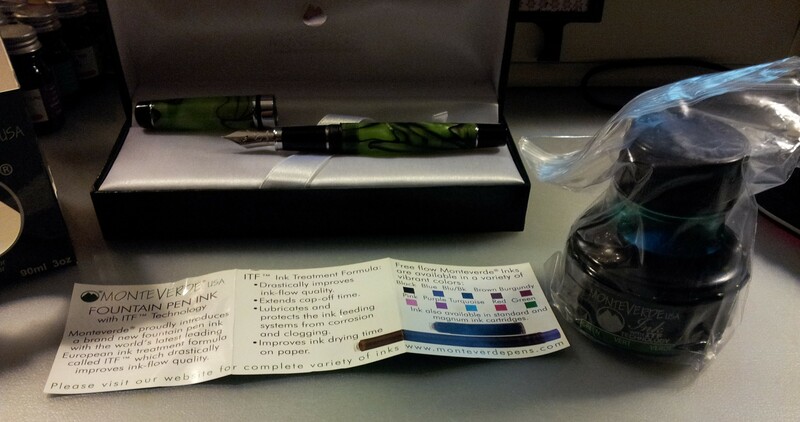 I bought 13 10 ml bottles of J. Herbin ink and one ink tin from JetPens. In the picture above the bottles are sitting on their corresponding ink splash. I haven’t decided if I want the Bouton D’or; I’ve never been a fan of yellow and it looks like highlighter ink to me. 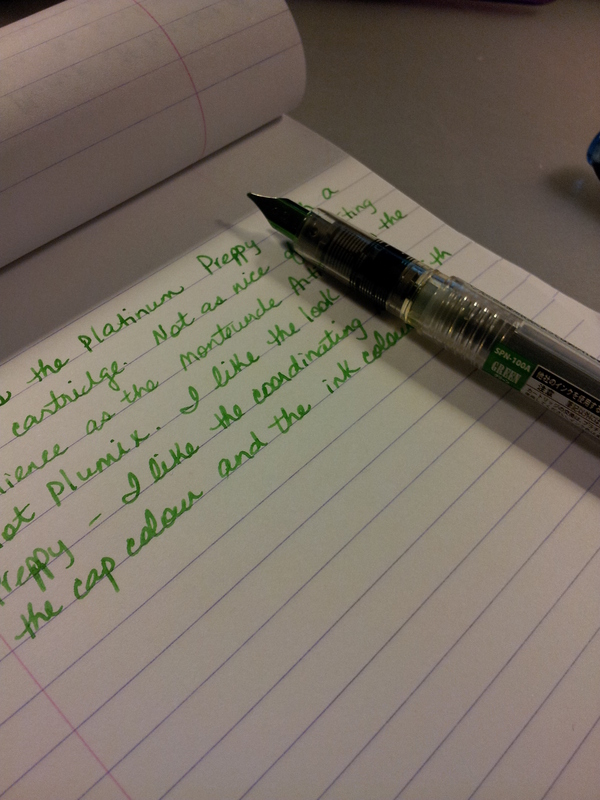 The only colour I don’t have (because JetPens was out) is Diabolo Menthe. I bought the 10 ml bottles for two reasons: they were cheaper than the tins ($4.75 as opposed to $5.50) and I’m using a syringe to fill my pens more and more so the bottled ink made more sense. 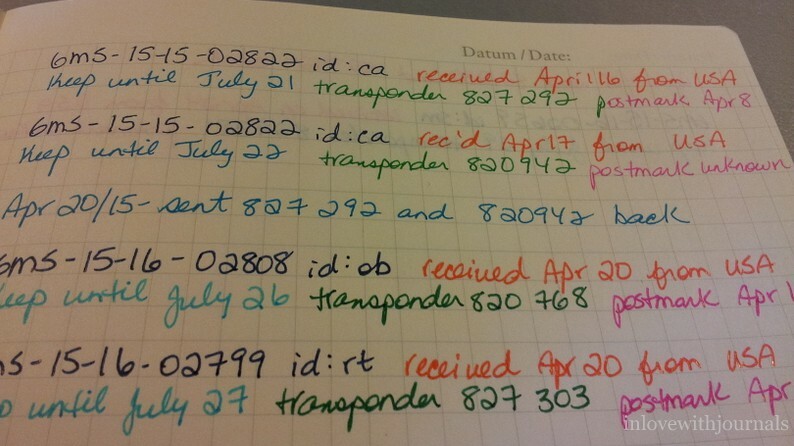 Here’s how the ink looks in my cabinet. Seriously, I should NOT be buying any ink in 2015; I have more than enough! I also updated my ink journal, which took forever! Rouge Opera on the left and Cacao du Bresil on the right. The Cacao du Bresil looks more grey than brown. Vert Reseda on the left and Bleu Myosotis on the right. And finally Cafe des Iles on the left and Poussiere de Lune on the right. Just a few examples of how I’ve recorded the 13 10 ml bottles. I will update them when I’ve inked up some pens, to show how they write. 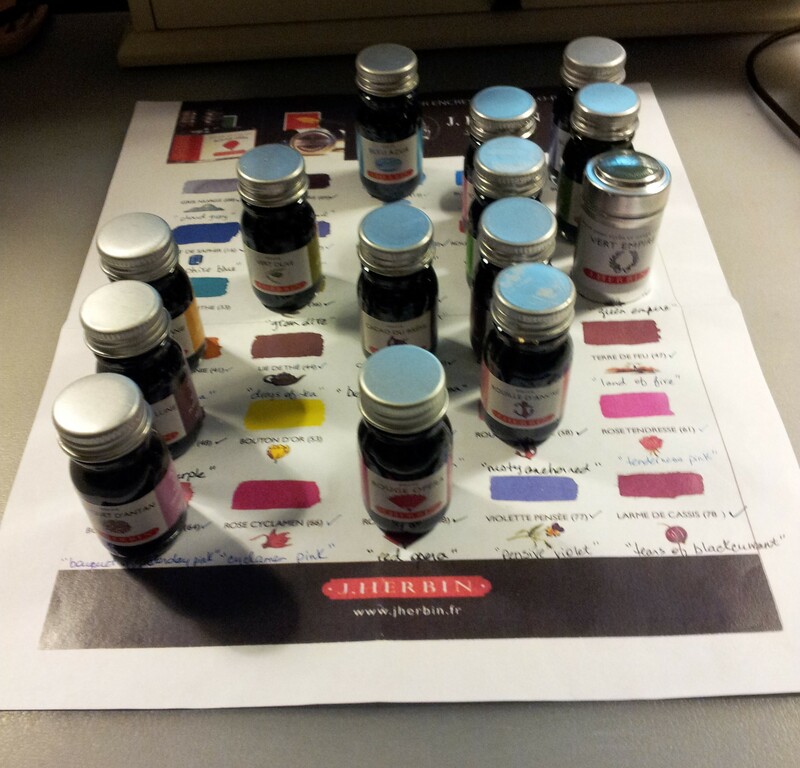 So once I get Diabolo Menthe my J. Herbin collection will be complete (without the bright yellow one – ick!) It will feel good to complete the set. Now I just have to make sure I use them all! 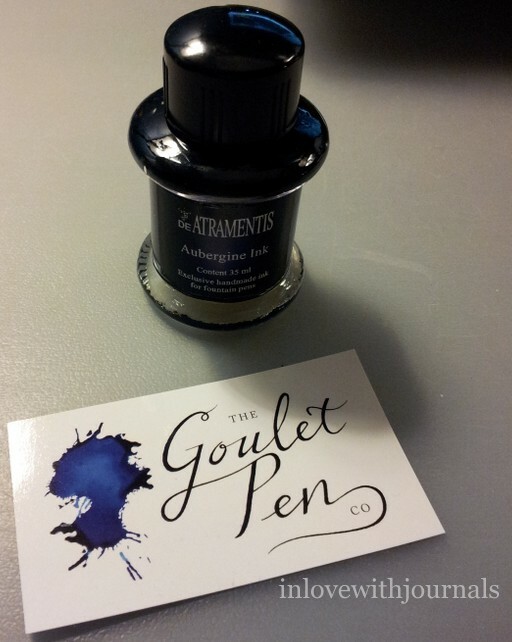 In the weeks leading up to my trip to Phoenix I placed an order with Goulet Pens (and also one with JetPens but that is for another post). I had enough credit with World Mail Panel to order the Monteverde Prima in Green Swirl, which is the third in my set of Monteverde Primas (click here for a post on the Turquoise Swirl, and here for the Purple Swirl). And for the months of November and December Goulet Pens is offering a free bottle of Monteverde Ink with a Monteverde pen purchase (or free cartridges if you purchase a Monteverde pen that only takes cartridges). 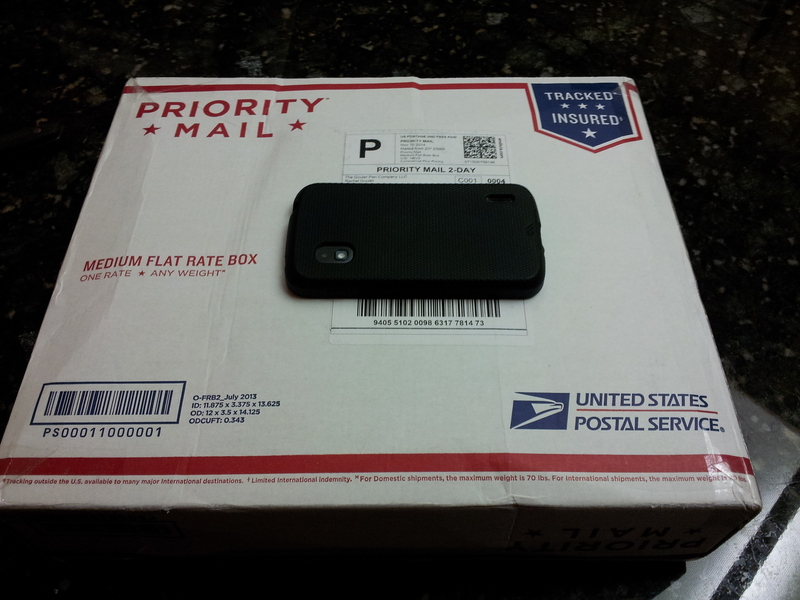 And with my sister’s good grace she let me take advantage of super cheap shipping to her US address. The box arrived before I did. And of course there are always extra goodies in a package from the Goulets. Matt signed my invoice in Noodles’s Navy. Now the background will change from my sister’s kitchen to my desk. There were a couple of Christmas presents from our father in the Goulet package so of course we haven’t opened them yet. I will share that after Christmas. 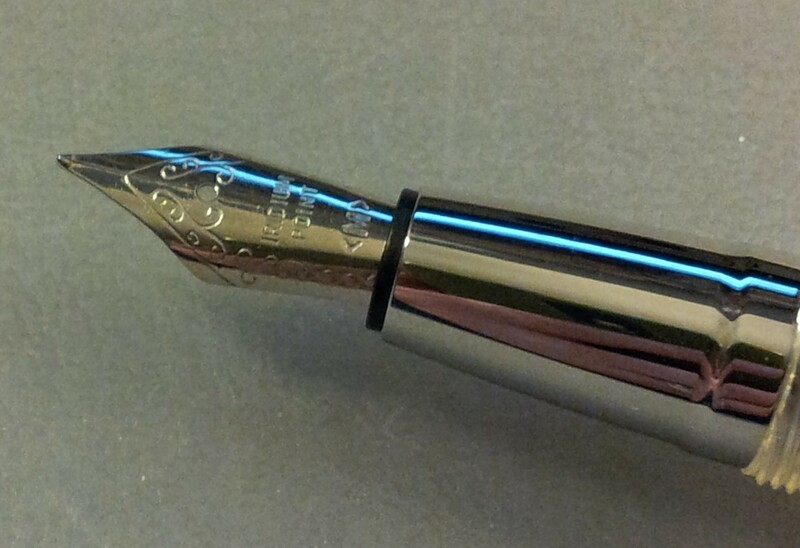 A close-up of the nib. I got this one in Medium, which is the same as the Turquoise. Look at that green cap!! LOVE the colour. 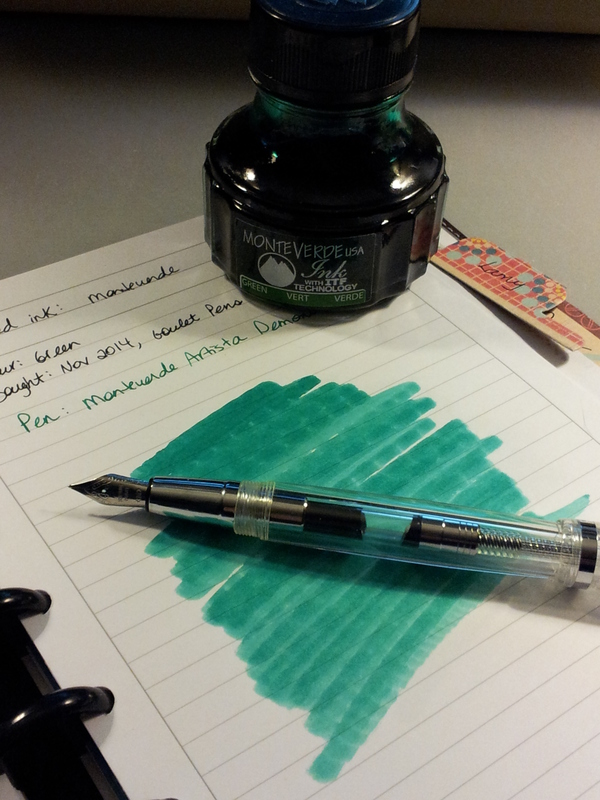 My first ever bottle of Monteverde ink. 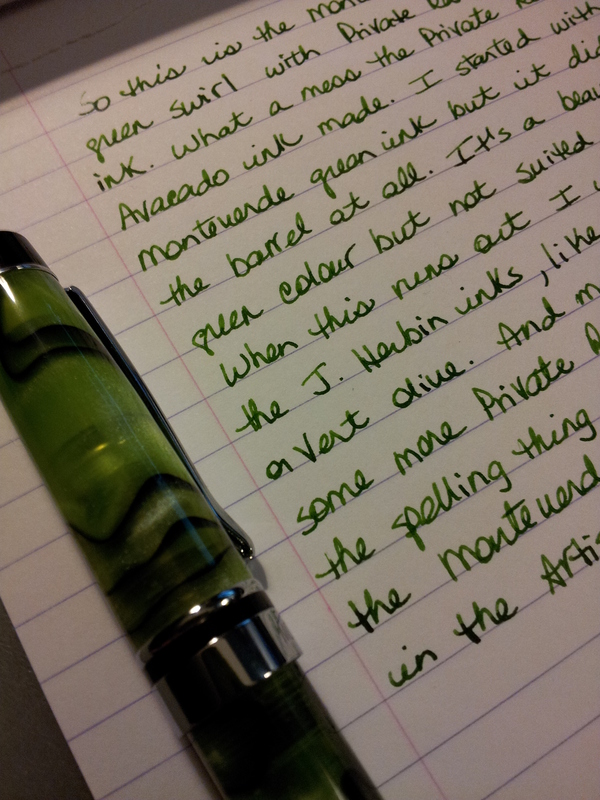 I ordered green to match the new pen. And because of the promotion, the ink was free. I must say I was impressed with the packaging. I don’t know if Goulet put the bottle in a ziploc bag or if that’s how they come from Monteverde, but it’s a great idea. And the pamphlet shows you the other inks that are available and talks about how their ink contains ITF (Ink Treatment Formula), which apparently improves ink flow, extends cap-off time, lubricates the feed and improves ink drying time on paper. Neat. 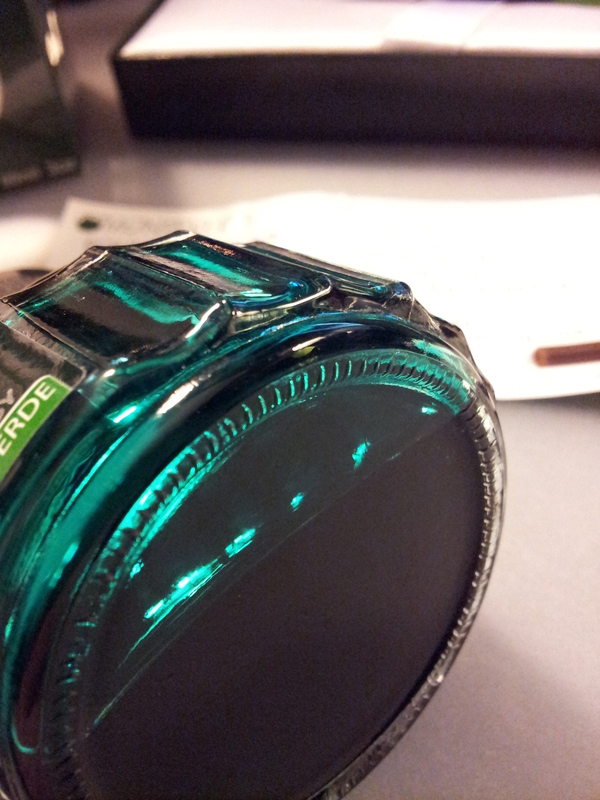 This ink is more of a blue green, at least it looks that way in the bottle. Not sure it will match the barrel. Yep not going to work in the green swirl. It’s a beautiful colour but is a bit too blue. It reminds me of the Bleu Pervenche ink I use in the turquoise swirl. 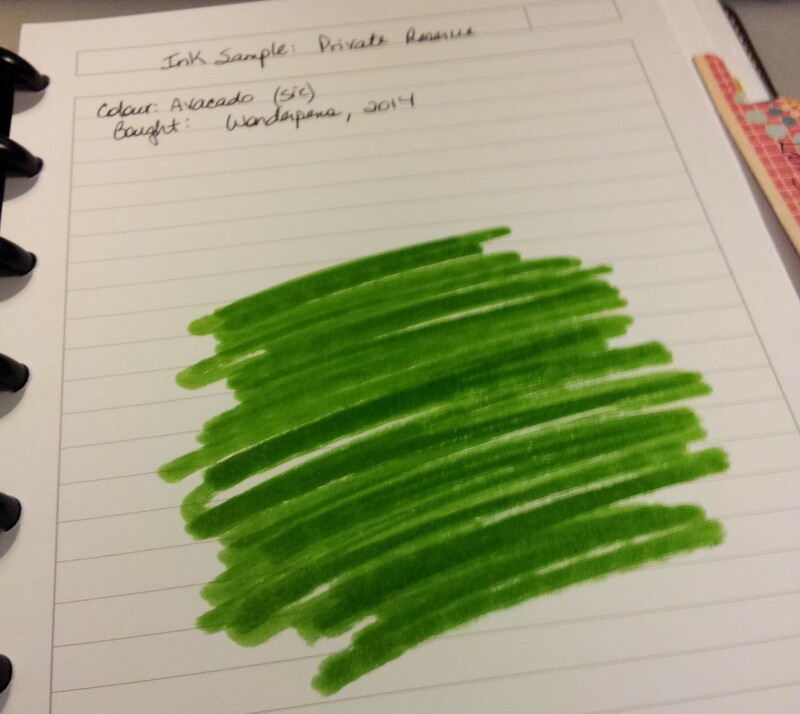 I looked through my Ink Journal and found the Private Reserve Avacado (sic) ink that would probably be a good match. Love this combination. I had a fair bit of problems with the Private Reserve ink however. My fingers are very, very green right now. There was some sort of skin on top of the ink that I had to dispose of first. Yuk. I have heard that skins can occur with Private Reserve ink but this is the first time it’s happened to me. Ultimately worth the aggravation because I really enjoy this combination. And here are the three lovelies together. It’s interesting to see how the purple has white swirls, the green has black, and the turquoise has both. I’ve never noticed that before. There are five in the series, and the other two are Tiger Eye Swirl and Black Swirl. Tiger Eye is similar to the Green in that it has black swirls. And the Black Swirl is unique in that it is mostly black with a green swirl. I’m not a big fan of the Black Swirl but in another four months I will have enough credits with World Mail Panel to get the Tiger Eye. And then I think my Prima collection will be complete. I don’t see the point of getting the Black Swirl just to have the complete set, when I don’t really like it. I had my second acupuncture treatment this week, which introduced B12 shots, which are key to nerve regeneration, useful in the treatment of sciatica. The acupuncture needles and the B12 shot are inserted in my posterior, making this one of the more painful treatments I’ve tried. But the results are solid and I will continue them. Loads of notes about my trip to Phoenix, which, like my trip to Vancouver Island earlier this year, is essentially private and will not be shared on here. But I will share lots of photos of my Goulet Pens and JetPens orders, as well as the glorious morning my sister and I spent at Scottsdale Pen and Knife. Watch for future blog posts. Being on holiday I’ve written only 3 pages in my journal. So I haven’t had a chance to write about my purchases of late. But I wanted to share them so I’ve included them above. The bold is a reminder to me that I need to photograph and write blog posts about those items. 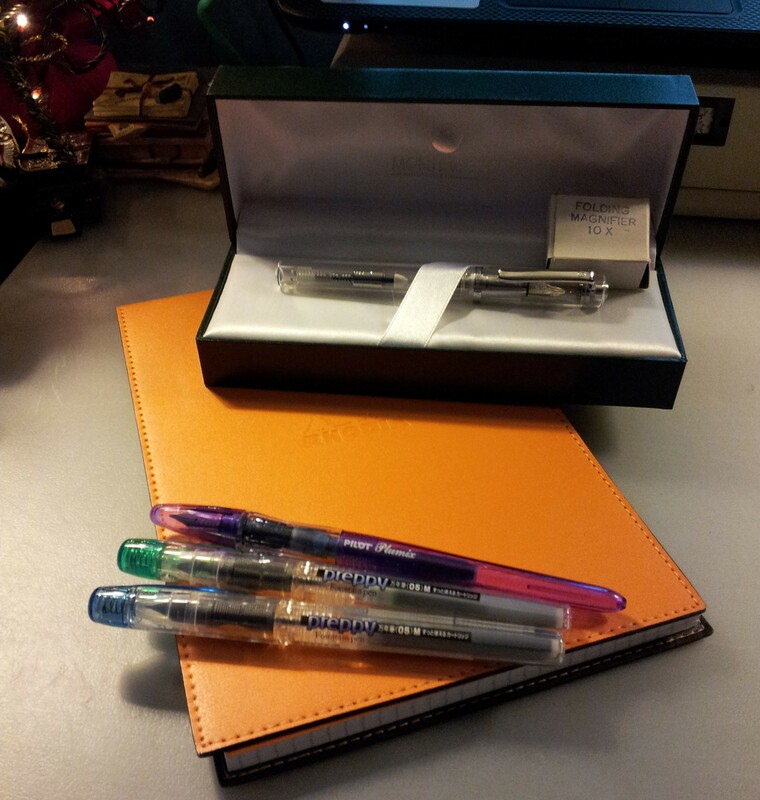 Yes I’ve taken advantage of my sister’s goodwill and used her US address for two orders to Goulet Pens and JetPens. 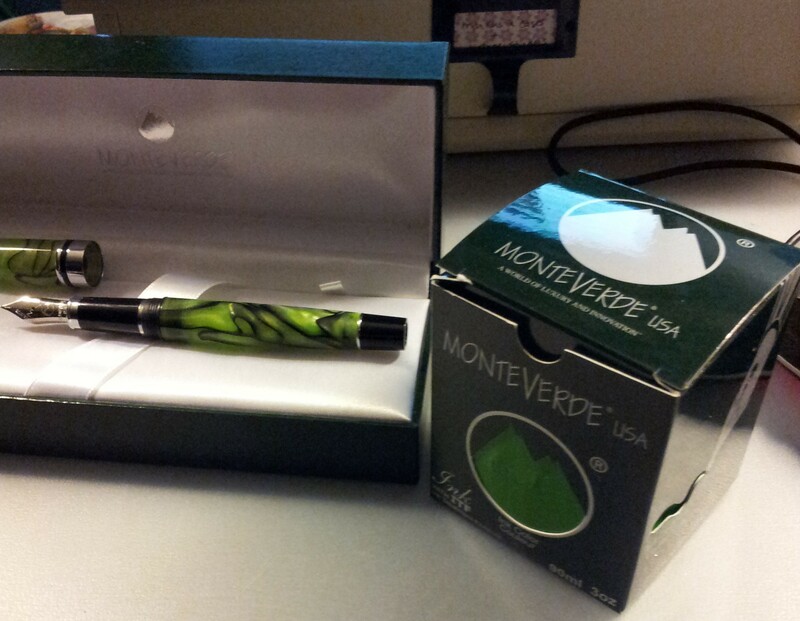 I used the proceeds from my World Mail Panel efforts to finance the Monteverde Prima in green, and I also purchased two Christmas gifts for my sister and I, from our father. So more on that after Christmas. And I’ve wanted to complete my J. Herbin collection for some time now and with free shipping and a great sale I couldn’t resist getting 16 of the mini bottles of J. Herbin ink. Now there is only one colour I don’t have: Diabolo Menthe. Exciting stuff! And yesterday my sister and I went to Scottsdale Pen and Knife and boy did we have fun! 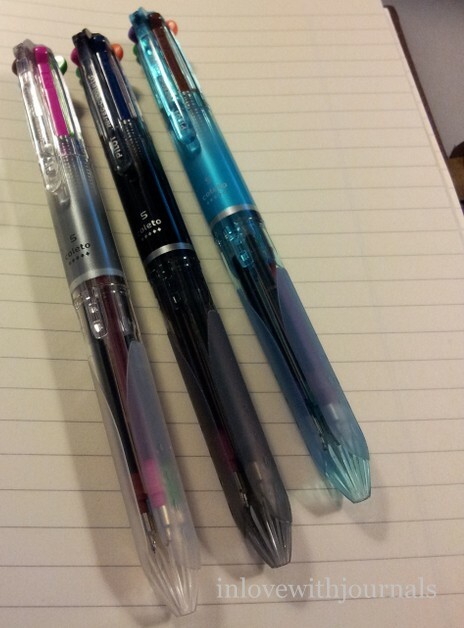 I bought 4 fountain pens and a notebook. The owner, Jay Sadow, spent a lot of time with us, answering questions and showing us beautiful pens and pencils, and just being wonderful. All of these new purchases will get full blog posts once I’m home. Until then happy writing!